Tottenham have banned "several" fans for persistent standing since their new stadium opened this month. 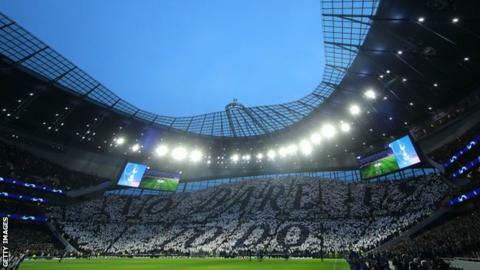 Spurs beat Crystal Palace in the first game at the £1bn Tottenham Hotspur Stadium on 3 April, and fans were warned before Tuesday's 1-0 Champions League quarter-final first-leg victory over Manchester City. "It is important that everyone is able to see the match and enjoy it," read a Spurs email to supporters. The length of the bans is not known. Mauricio Pochettino's side, who are fourth in the Premier League, host Huddersfield on Saturday.